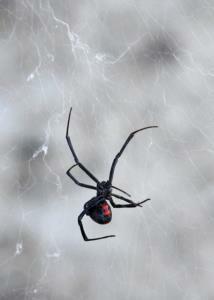 This spider was spotted under the table at Bell's Point. Be careful where you sit! Temps started at 82, ended at 97. High, wispy clouds then sunny and hot, Light fairly consistent breeze. Drought continues in San Angelo and the effects are seen and felt at the park. There are few flowers in bloom, the vegetation is dormant or dead and the wildlife is not to be seen. The trails are easy to see but have become harder to hike on because soil has blown away leaving more exposed rock. A few portions of West Potts Creek near the northern end, are very eroded and require caution when treading on them. Park personnel need to take a couple of loads of small rock and try filling in some of the deepest crevices to stop the erosion. Nonetheless, hiking at the park is better than staying in the house!